I ordered the plans for the Paulk Workbench II and built it over the holiday. If you are interesting in the plans you can purchase them off the Paulk website. I designed it from the plans in VCarve Pro and cut it ALL out on my CNC. It assembled perfectly and was very easy to do from the plans. The only challenge was how to cut the long 2X8 foot sections on a 30 inch CNC. Fortunately VCarve Pro has a tiling option that works great for this exact issue. this is very cool, Im impressed! Cool, indeed. I’m going to have to look into that tiling option you mentioned. I have some projects coming down the road that are going to require cuts outside of the XXL cut volume. It is VERY easy to use. If you need help let me know. I’d be keen to know how - if possible using fusion 360. I have read about tiling but no idea on how to do it. It is possible and would be very easy to do. I used VCarve Pro to do mine but in a simple form you could make a 2 foot X 2 foot grid of holes and cut them in the first two feet of the top. Mark every two feet down the top and reference that point to the zero on your machine. When I cut mine, I simple zeroed the machine to the very front of the wasteboard and then lined up the 2 foot marks and cut each tile that VCarve Pro measured for me on the 2X8 foot top. VCarve just makes it much easier especially for those sizes that are not as convenient as this would be. 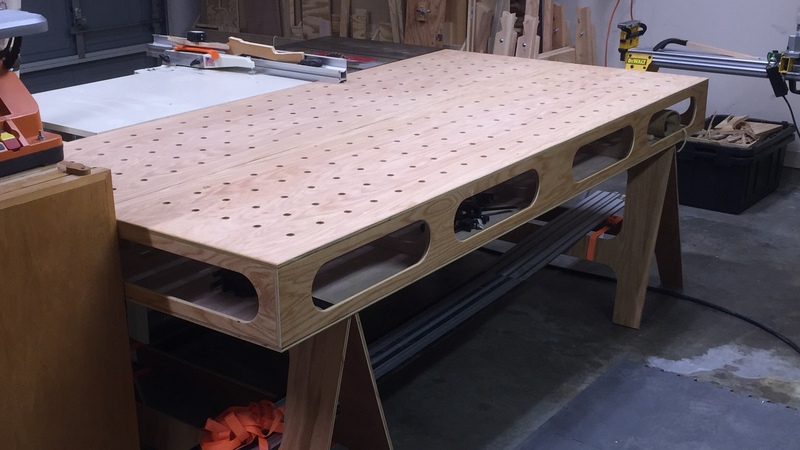 Stacy, I know it’s 2 years later, but would it be possible for you to share the file you created to make this work bench? I’ve never done this but I will be taking a class and joining Hacker Lab in Sacramento to use their Shop Bot. I wish I could. I talked to Ron about giving it to him and letting him sell it as part of his plans. He got pretty nasty with me about the copyright issues and I was like dude I was talking about giving it to you and not others. So apparently it is a big deal to him that no electronic versions are out there which I understand. He makes part of his living off of selling these plans and benches on Fastcap’s site. Sorry man. Wish I could help.